Some gardeners are all about herbs. Some gardeners are all about their roses. But there is no one quite as obsessive as the gardener who likes to grow tomatoes. 1. Type. Not variety, but type. There are two types of tomatoes: determinate and indeterminate. You can remember it this way: determinate determine to all ripen together, so that you’ve got a great crop all at once to can or freeze. They are bush like, and don’t get nearly as big as the other. Which is indeterminate, as in, they can’t determine when to ripen, so they all do it at their own speed. Indeterminate tomatoes are like thick vines, just growing and growing until you tell them to stop. So if you’re wondering what kind of tomato to get, the answer lies in what you want tomatoes for. Salad? Cherry-type tomatoes–they’ll likely be indeterminate–vine-like. Canning? Plum-type, and/or determinate, ripening pretty much all at once. Maybe you want to spread out the harvest but still for the purpose of canning–get two different kinds of determinate tomatoes with different length maturation. For eg. Celebrity tomato is determinate, ripening in 70 days from sowing. Roma, plum and determinate, ripens in 80 days. So you have time to get the Celebrity in and canned before the Romas are ready. This tomato seedling can’t be planted out for weeks yet but you can see it’s already pretty tall. I’ll give it as much light as I can, but when I put it in the ground I’ll bury most if not all that stem. with still a month to go before I can plant them out. 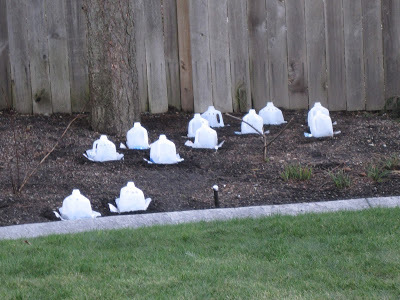 Before planting them out they have to be hardened off, which will take a week. That still leaves three weeks of growing indoors without getting stunted, or too leggy, or starved for nutrition, or left dry for too many minutes… I’ve decided to try the milk jug treatment so I can get them outside two weeks early. Hot weather, enough but not too much water, (slow down watering by mid-late summer so the plant will focus on fruiting instead of continuing to put on green growth–unless you’re using containers, in which case just continue as normal), protection from rain as the summer nights start to get cooler (we suffer from late blight here). Again, here on the “wet coast” buying tomato plants that have a short maturation time can take advantage of our good July and ripening in August. Most of the cherry/grape style toms mature in 60-65 days. 3. Staking. If your tomato is a vine-grower you’ll have to have some way of keeping it frowing upright. And once the tomatoes start to grow, they get heavy. Those little tomato cages you see at the hardware store will NOT hold up your crop. So decide whether you’re going to splurge on bigger better cages that will last many years, or create another kind of support–like this one from Doug Green’s Garden. Here’s one last little trick, don’t remember where this came from. When you’re ready to get the plants in the ground, the day before, put them outside lying down. By the next day the growing end will have started to turn upward toward the light (looking like a hockey stick), so then you can easily plant it in your trench with the tops sticking out. So I have to say, if I can grow tomatoes, anyone can grow tomatoes. And that’s the end of Boot Camp. Get out there and grow some supper! And let me know how it’s going. I’ll keep you posted on my successes as well–of course this year I will actually have some successes! Since this whole Boot Camp was about offering quick lessons to take the beginning gardener from fear of starting to joy in succeeding, here’s a link to another gardner’s suggestions for the beginner: In Lee Reich’s Garden. 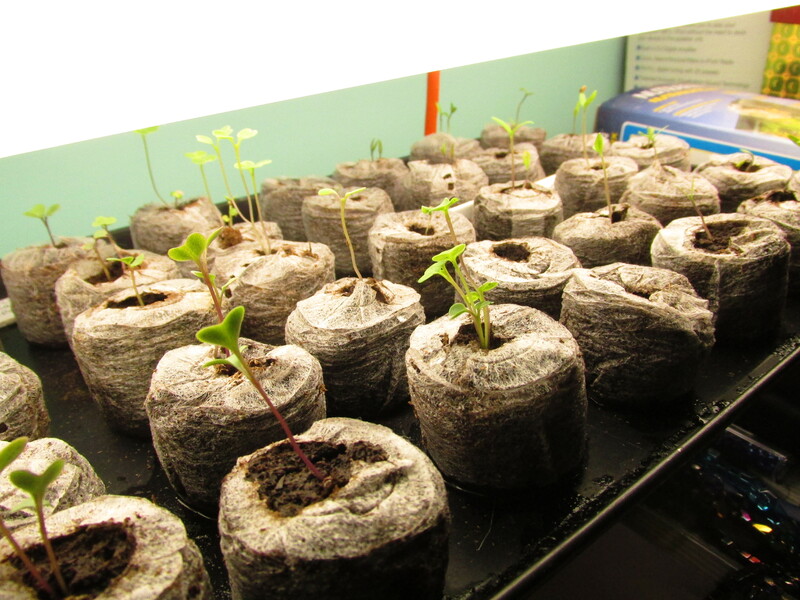 The reason I’ve grouped Boot Camp Day 16 (Seed-Starting) and Day 17 (Seedling Transplanting) together is because I wrote about seed starting already on Day 14, and besides, they’re pretty closely related. This is the carrot bed. Tiny seeds sown thinly and shallowly, onto very damp soil, barely covered with light fine compost, and then covered with black plastic to maintain the moisture without the seeds washing down the drain in typical spring “showers”. The same treatment a few weeks ago, and these are the carrots today. 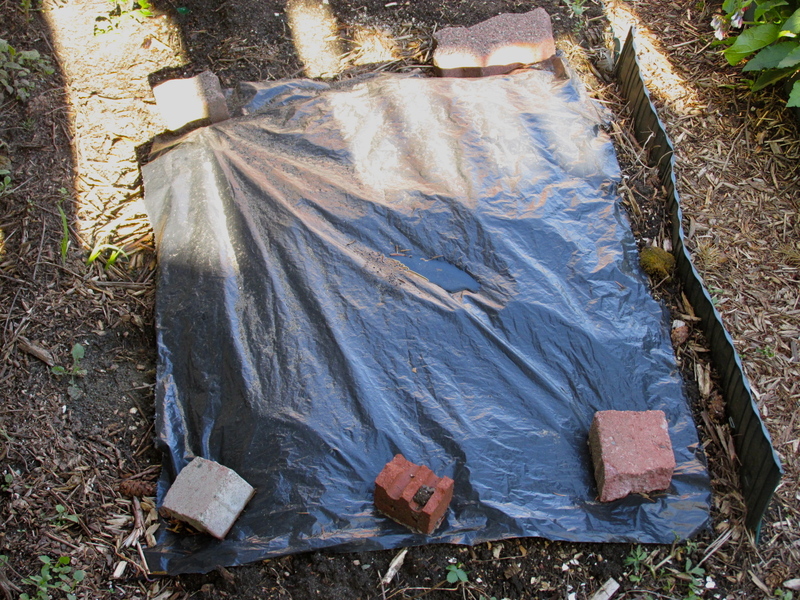 So a quick review: if you’re sowing outdoors, make sure the seeds stay moist. That’s pretty much it. If you’re sowing indoors, you need strong light (remember my friend with LOTS of windows in a west facing room), constant moisture– the seed starting medium will dry out faster indoors than outdoors, a bit of a breeze from a fan will help prevent fungal disease commonly called “damping off”, and you might want to consider underneath heat from a heating pad, the fluorescent light fixture, or a seed starting mat. I haven’t made any mention of seed starting medium (except a second ago): I use Jiffy pellets for convenience. Broccoli Raab, Purple Sprouting Broccoli, 4 different kinds of tomatoes. I don’t recommend using peat/paper/coir pots (which in theory are meant to be planted whole), unless you are very careful to make sure the whole pot is buried in soil, and no portion of it is peaking over the soil. If it is peaking out of the soil, that edge will dry out and wick up all the moisture in the pot, making it difficult to keep the soil immediately around the root moist. Ask me how I know this… And of course, you’re only doing a small vegetable garden to start with, to maximize your success and gratification. Most seedlings, and maybe all seedlings should be “hardened off” before actually being planted in the ground. I’ve read that you should take at least a week to gradually acclimate them to the outdoors, starting in a sheltered place for an hour or so and building up to full time in the kind of exposure they’ll live in. Mine go to the back veranda– bright but not direct sun, close to the house, so not too windy, and I start with 2 hours, go to 4 , then 6 etc. When it’s time to finally time to get them in the ground, follow Garden Tribes instructions, and they’ll be happy as clams. And don’t forget, (Charles Dowding mentions it as well) don’t be afraid to plant your vegetable transplants deeper than they are in the starting medium. 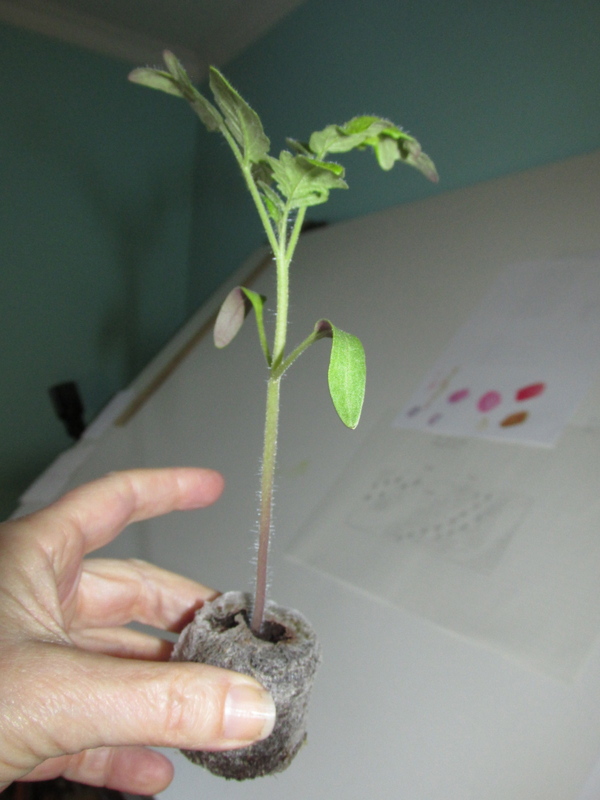 This tomato seedling can’t be planted out for weeks yet (altho I might try the milk jug trick again), but you can see it’s already pretty tall. I’ll give it as much light as I can, but when I put it in the ground I’ll bury most if not all that stem. 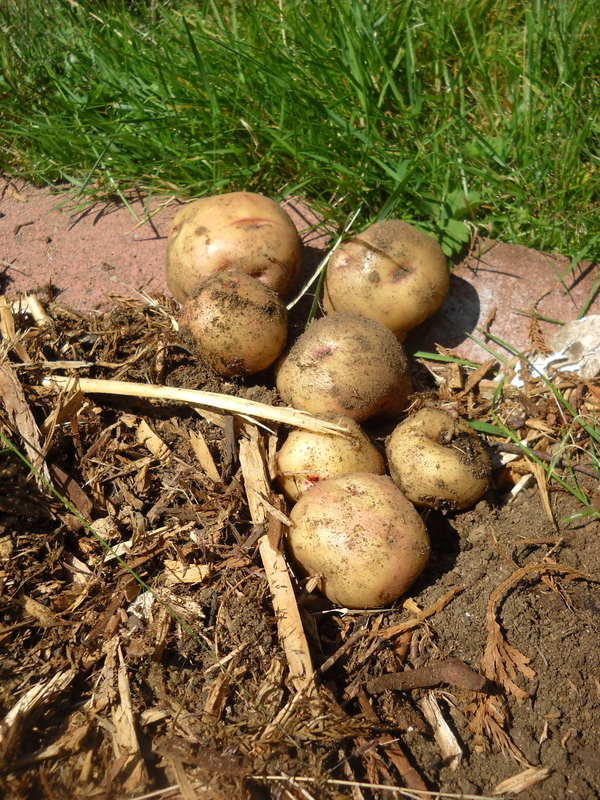 Potato harvest. One of my favourite things to grow, even tho’ they’re cheap to buy. Day 5 of Garden Tribe’s 21-day Boot Camp is sub-titled “Right Sizing for Success”. Which incidentally I’ve already addressed in Veggie Garden Day 3. 1. 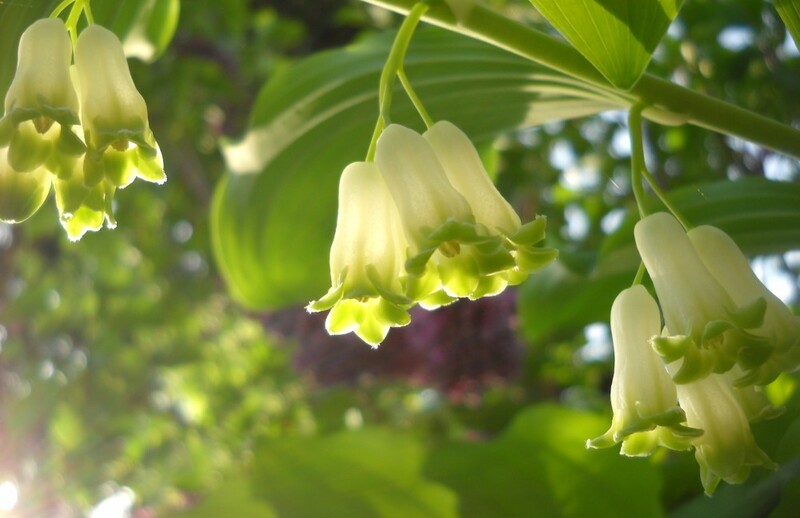 No garden is “no-maintenance”, so be realistic about how much time you can spend working in the garden. I’m usually reluctant to use the word “working”, because I always want people to feel like this is an enjoyable activity, not a chore. But in this case, since success is what we’re after here, I have to admit there are a few garden-related tasks that are less fun, more duty. Like weeding. 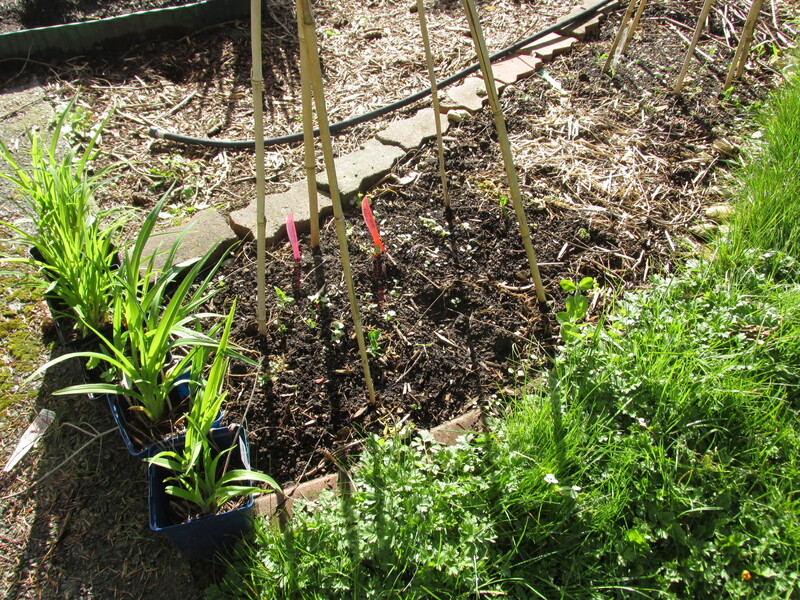 It’s pretty hard to grow vegetables without incurring weeds. So what do you think? One hour per day? Two hours per week? Can you get into the garden for 15 minutes before or after an 8-hour work day? 3. Another thing–mentioned yesterday–is to only sow a portion of your patch at a time, then sow a few more next week and a few more the following week. That way the crop will mature over an extended time instead of all at once. Now having said that, some crops that are slow to put on growth in the cooler weather will be faster when it warms up a bit, so the later-sown ones may actually catch up the the earlier-sown ones. No problem, you’re still getting vegetables on your plate. Tomorrow’s subject: draw it all out.